Hedge fund managers like David Einhorn, Bill Ackman, or Carl Icahn became billionaires through reaping large profits for their investors, which is why piggybacking their stock picks may provide us with significant returns as well. Many hedge funds, like Paul Singer’s Elliott Management, are pretty secretive, but we can still get some insights by analyzing their quarterly 13F filings. One of the most fertile grounds for large abnormal returns is hedge funds’ most popular small-cap picks, which are not so widely followed and often trade at a discount to their intrinsic value. In this article we will check out hedge fund activity in another small-cap stock: Universal Health Services, Inc. (NYSE:UHS). Is Universal Health Services, Inc. (NYSE:UHS) a buy right now? Hedge funds are becoming less hopeful. The number of bullish hedge fund bets went down by 4 recently. Our calculations also showed that UHS isn’t among the 30 most popular stocks among hedge funds. UHS was in 28 hedge funds’ portfolios at the end of the fourth quarter of 2018. 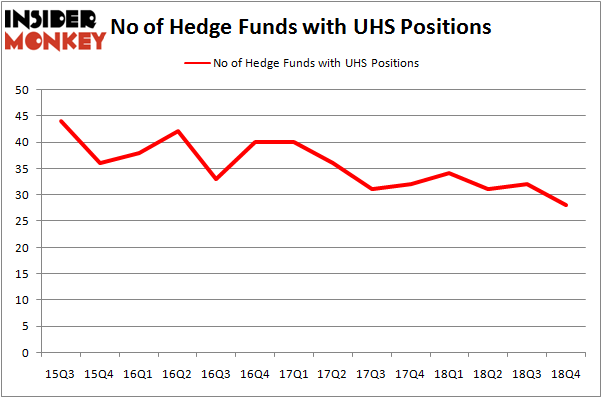 There were 32 hedge funds in our database with UHS holdings at the end of the previous quarter. At the moment there are several indicators stock market investors employ to assess stocks. A couple of the less utilized indicators are hedge fund and insider trading moves. We have shown that, historically, those who follow the best picks of the top investment managers can trounce the market by a healthy amount (see the details here). Let’s go over the new hedge fund action surrounding Universal Health Services, Inc. (NYSE:UHS). What have hedge funds been doing with Universal Health Services, Inc. (NYSE:UHS)? At the end of the fourth quarter, a total of 28 of the hedge funds tracked by Insider Monkey held long positions in this stock, a change of -13% from one quarter earlier. By comparison, 34 hedge funds held shares or bullish call options in UHS a year ago. So, let’s find out which hedge funds were among the top holders of the stock and which hedge funds were making big moves. More specifically, Glenview Capital was the largest shareholder of Universal Health Services, Inc. (NYSE:UHS), with a stake worth $228.8 million reported as of the end of September. Trailing Glenview Capital was Camber Capital Management, which amassed a stake valued at $104.9 million. Nokota Management, AQR Capital Management, and Healthcor Management LP were also very fond of the stock, giving the stock large weights in their portfolios. Since Universal Health Services, Inc. (NYSE:UHS) has witnessed declining sentiment from the smart money, it’s safe to say that there is a sect of fund managers that slashed their positions entirely in the third quarter. At the top of the heap, Jim Simons’s Renaissance Technologies dumped the largest stake of the “upper crust” of funds followed by Insider Monkey, comprising about $41.5 million in stock, and Brett Barakett’s Tremblant Capital was right behind this move, as the fund dropped about $34.9 million worth. These bearish behaviors are interesting, as total hedge fund interest dropped by 4 funds in the third quarter. 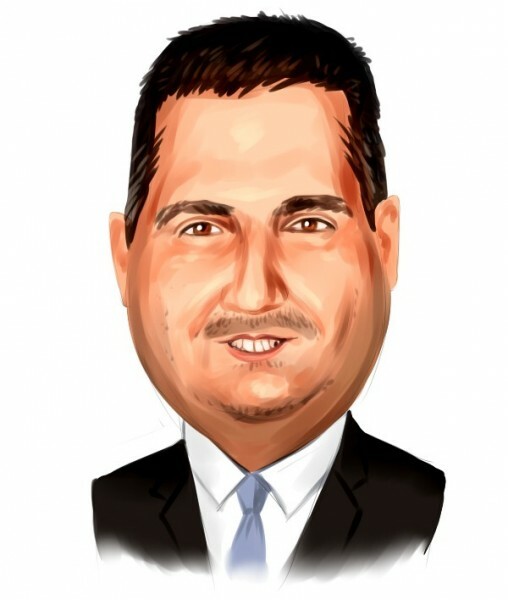 Let’s go over hedge fund activity in other stocks – not necessarily in the same industry as Universal Health Services, Inc. (NYSE:UHS) but similarly valued. These stocks are Martin Marietta Materials, Inc. (NYSE:MLM), CarMax Inc (NYSE:KMX), Lamb Weston Holdings, Inc. (NYSE:LW), and iQIYI, Inc. (NASDAQ:IQ). This group of stocks’ market caps resemble UHS’s market cap. As you can see these stocks had an average of 29.75 hedge funds with bullish positions and the average amount invested in these stocks was $1251 million. That figure was $735 million in UHS’s case. Martin Marietta Materials, Inc. (NYSE:MLM) is the most popular stock in this table. On the other hand iQIYI, Inc. (NASDAQ:IQ) is the least popular one with only 25 bullish hedge fund positions. Universal Health Services, Inc. (NYSE:UHS) is not the least popular stock in this group but hedge fund interest is still below average. This is a slightly negative signal and we’d rather spend our time researching stocks that hedge funds are piling on. Our calculations showed that top 15 most popular stocks among hedge funds returned 19.7% through March 15th and outperformed the S&P 500 ETF (SPY) by 6.6 percentage points. Hedge funds were also right about betting on UHS, though not to the same extent, as the stock returned 15.2% and outperformed the market as well.